Have on Billboard’s Pop Chart? While in a Seattle Borders bookstore recently, I was checking out the store’s music shelf when a yellow and black book spine jumped out at me. Elvis for Dummies it read. 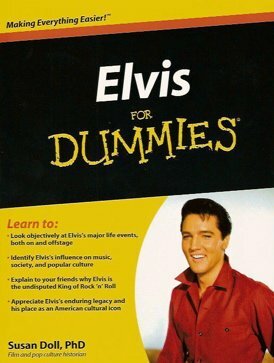 Of course, I was familiar with the “For Dummies” series but never knew there was an Elvis volume in it. I pulled it off the shelf and glanced at the cover. The author, Susan Doll, was identified as a “Film and pop culture historian.” She sounded like an intelligent Elvis observer to me, not one of those former Presley cronies or girlfriends with an agenda to advance or an ax to grind. The cover also promised that the reader would, “Learn to look objectively at Elvis’s major life events, both on and offstage.” Hey, that sounded right up my alley! As I was in a hurry, I purchased the book without glancing inside. However, had I looked at the book’s very first page in the store, I probably would have put the book back on the shelf. It was labeled a “Cheat Sheet,” which I suppose is a standard feature in all “For Dummies” volumes. Doll started out her Elvis “Cheat Sheet” with a list of “Elvis’s Number-One Singles.” She claimed that, “In Elvis’s lifetime, 18 singles reached the top of the Billboard Hot 100 chart.” Immediately, I rolled my eyes. Without even looking at the song titles, I knew I’d seen this bogus list before. It has been floated on Elvis fan sites for years and has been picked up and presented as genuine by writers in more respected media. Unfortunately, Susan Doll had fallen for it too. So, when Elvis first hit the charts with “Heartbreak Hotel” in March 1956, Billboard was still using the four pop lists mentioned above to rank the popularity of recorded songs. As Presley and other rock ’n’ roll singers started to dominate record sales, Billboard began to reorganize its charts. On June 17, 1957, the “Most Played in Jukeboxes” list was discontinued, followed by the “Most Played by Jockeys” chart on July 28, 1958. Then on August 4, 1958, the “Top 100” was replaced with the more detailed “Hot 100.” That list quickly became the industry standard, and the “Best Sellers in Stores” list was dropped two months later on October 13, 1958. That left the “Hot 100” as Billboard’s one and only major pop music chart. Therefore, none of Elvis’s major hits of 1956 and 1957 ever appeared on the “Hot 100,” as they were released long before that list came into being in the summer of 1958. For pop music historians, then, the quandary became how to rank recordings released before August 1958 with those released afterwards. Enter Joel Whitburn. A major record collector, Whitburn turned researcher in 1964. He went back to 1955, when Billboard first started its weekly “Top 100” chart, and gathered and organized information on every record that made that chart and its successor, the “Hot 100.” After five years of research, Whitburn published his first book, Record Research 1955-1969, to sell to radio stations and disc jockeys. In the 40 years since, Whitburn has authored dozens of books based on Billboard’s many record charts and is rightly considered the authority in that field. In the genre of pop music records, authors and researchers routinely consult Top Pop Singles, Whitburn’s periodically updated version of his original 1969 version. Somewhere along the way, though, Whitburn changed how he listed a record’s chart history. If you consult his latest Top Pop Singles volume, you’ll find Elvis now credited with 18 #1 singles, 4 more than Whitburn originally listed for him. The discrepancy results from a change in how Whitburn rates the popularity of records released before the “Hot 100” began in 1958. Whereas Whitburn originally ignored the “Sellers,” “Jockeys,” and “Jukebox” charts, he now embraces them all in assigning a highest chart number for a record in the pre-“Hot 100” era. For example, Elvis’s “Hound Dog” only got as high as #2 on the “Top 100” in 1956, so Whitburn originally did not recognize it as a number one record for Presley. Now, however, since “Hound Dog” did reach #1 on Billboard’s “Most Played in Jukeboxes” chart in 1956, Whitburn lists it as being a #1 record for Presley. Personally, I think Whitburn had it right originally. Start the rock era with the advent of the “Top 100” in November 1955, and rate all single recordings since then based solely on their performance on Billboard’s “Top 100” and subsequent “Hot 100.” That would simplify the process, give it a sense of fairness, and eliminate much of the confusion that now exists in comparing the work of artists, such as Elvis and The Beatles. To set the record straight, then, below is a list of the 18 Elvis singles on author Susan Doll’s list, along with accurate data about which actually did reach the top of Billboard’s Top/Hot 100 and which didn’t. My information, incidentally, comes from personally viewing every single Billboard weekly chart from 1956 through 1977 on microfilm at my local library and cross-checking my findings with Joel Whitburn’s. 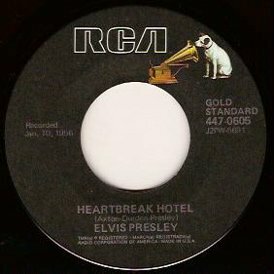 • Heartbreak Hotel: Elvis’s first RCA release reached #1 on the “Top 100” on May 5, 1956, knocking Les Baxter’s “The Poor People of Paris” from the top spot. Elvis’s single remained at #1 for 7 weeks, finally giving way to Gogi Grant’s “The Wayward Wind.” It was Elvis’s 1st #1 single. 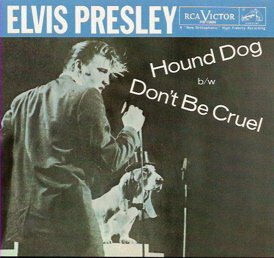 • Don’t Be Cruel: Elvis’s third single of 1956 also spent 7 weeks in the #1 position on the “Top 100.” It shoved “My Prayer” by the Platters out of the top spot on September 15, 1956. It dropped to #2 on November 11, replaced by “The Green Door” by Jim Lowe. It was Elvis’s 2nd #1 single. • Hound Dog: Although “Hound Dog” rode the “Top 100” for 28 weeks, it never reached #1. It spent 11 weeks in the top 10, but peaked at #2 two different times. In September 1956 it couldn’t budge the Platters’ “My Prayer” from the top spot, and in October “Don’t Be Cruel” stalled “Hound Dog’s” second run at #1. • Love Me Tender: The title song of Elvis’s first movie moved into a tie for #1 on the Billboard chart with “The Green Door” on November 11, 1956. 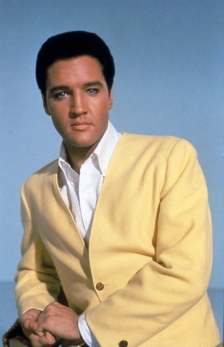 The Elvis single spent 2 more weeks alone at #1 before “Singing the Blues” by Guy Mitchell took over the top spot. 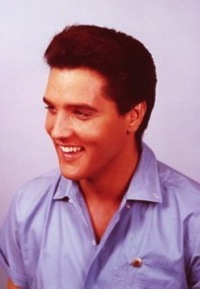 “Love Me Tender” was Elvis’s 3rd #1 single. • Too Much: Elvis’s first 1957 single release is the second mistake on Doll’s list. It peaked on the “Top 100” at #2 in March and spent 4 weeks there while Tab Hunter’s “Young Love” had a stranglehold on the top spot. 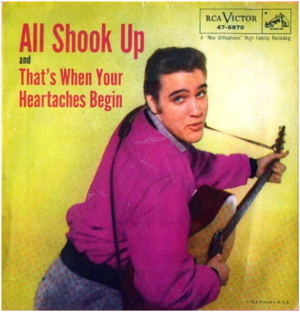 • All Shook Up: Elvis’s most successful chart single spent a phenomenal 30 weeks in the “Top 100.” It went quickly to #1, displacing Andy Williams’ “Butterfly” on April 20, 1957. It remained the chart’s top dog for 8 weeks, before finally losing the top spot to Pat Boone’s “Love Letters in the Sand.” It was Elvis’s 4th #1 single. • Teddy Bear: Elvis revenged Pat Boone’s insult when “Teddy Bear” knocked “Love Letters in the Sand” from the top spot on the Billboard chart on July 15, 1957. 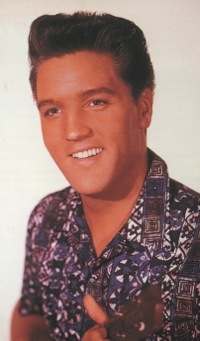 Elvis’s tune held the top spot for 7 weeks. It gracefully gave way to Debbie Reynolds’ “Tammy” the first week in September. It was Elvis’s 5th #1 single. • Jailhouse Rock: The title tune to Elvis’s third movie was his third blockbuster #1 hit in a row in 1957. It knocked the Everly Brothers’ “Wake Up Little Susie” from the top spot on November 4 and remained at #1 for 6 weeks before finally moving aside for Sam Cooke’s “You Send Me.” It was Elvis’s 6th #1 single. • Don’t: Elvis’s first 1958 release also reached #1, but barely. It spent just one week in the top spot on March 10. “Tequila” by The Champs took over the #1 position the following week. “Don’t” was Elvis’s 7th #1 single. • Hard Headed Woman: Doll got this one wrong. Elvis’s single from King Creole peaked at #2 and spent just one week at that level. It was kept out of the #1 spot by “Yakety Yak” by The Coasters. • A Big Hunk O’Love: This was the only Presley single released during his two-year army hitch to reach #1. It spent two weeks atop the “Hot 100” in August 1959. It followed Paul Anka’s “Lonely Boy” at #1 and preceded The Browns’ “Three Bells” at the top. It was Elvis’s 8th #1 single. • Stuck on You: After his return to civilian life, Elvis’s first four singles all reached #1 on the “Hot 100.” “Stuck on You” spent 4 weeks at the top after taking over from Percy Faith’s “Theme From a Summer Place” on April 25, 1960. The Everly Brothers followed Elvis at #1 with “Cathy’s Clown” on May 23. It was Elvis’s 9th #1 single. 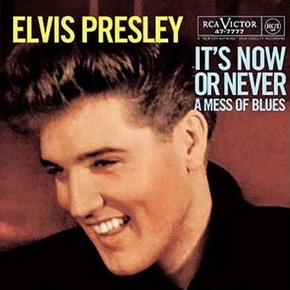 • It’s Now or Never: Starting on August 15, 1960, Elvis’s classic recording spent five weeks atop the “Hot 100.” It was preceded at #1 by Brian Hyland’s “Itsy Bitsy Teenie Weenie Yellow Polka Dot Bikini” and followed by Chubby Checker’s “The Twist.” It was Elvis’s 10th #1 single. • Are You Lonesome Tonight? 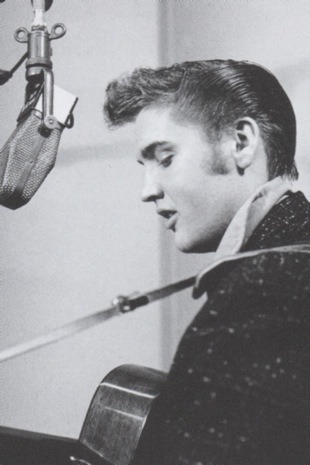 : Elvis’s third single of 1960 made that his best chart year since 1957. It reached #1 on the “Hot 100” on November 28, replacing “Stay” by Maurice Williams and the Zodiacs. It was Elvis’s 11th #1 single. • Surrender: Elvis made it four in a row at #1 when “Surrender” took over the top stop from Chubby Checker’s “Pony Time” on March 20, 1961. 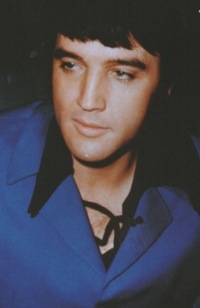 After two weeks at #1, it gave way to The Marcels’ “Blue Moon.” It was Elvis’s 12th #1 single. • Good Luck Charm: A year would pass before Elvis had another #1 single. “Good Luck Charm” replaced “Johnny Angel” by Shelley Faberas, his future movie costar, at the top of the Billboard pop chart on April 21, 1962. Elvis held the #1 spot for one more week, after which “Soldier Boy” by the Shirelles took its place. It was Elvis’s 13th #1 single. • Suspicious Minds: Seven long years of mostly forgettable single releases would pass before Elvis again topped the “Hot 100.” On November 11, 1969, “Suspicious Minds” squeezed ahead of The Temptations’ “I Can’t Get Next to You” to become Elvis’s 14th and last “Hot 100” #1 single. The very next week “Suspicious Minds” was knocked off the top spot by “Wedding Bell Blues” by the Fifth Dimension. • Burning Love: Doll’s “Cheat Sheet” in “Elvis for Dummies” lists “Burning Love” as Elvis’s 18th #1 single. 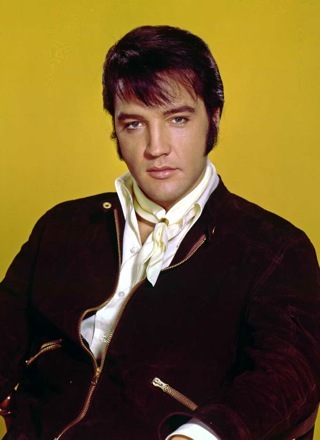 In fact, while it was Elvis’s most successful single in several years, “Burning Love” did not reach #1 on the “Hot 100.” It peaked at #2 in October 1972. "'Elvis for Dummies' claims that, 'In Elvis’s lifetime, 18 singles reached the top of the Billboard Hot 100 chart.' Immediately, I rolled my eyes. Without even looking at the song titles, I knew I’d seen this bogus list before."